recipe: peanut butter power balls. 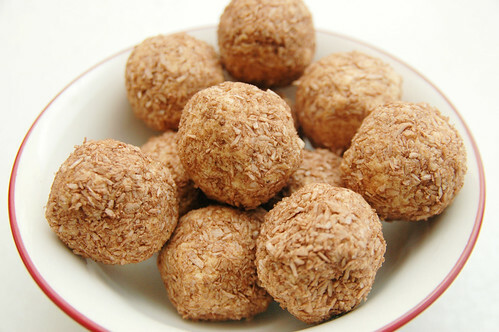 regular readers may recall my recipe for no-bake gluten free energy bites which are a super tasty source of energy but aren’t particularly packed with protein ( maybe about 3-4 grams of protein per 1 inch ball ). what with all the running i’ve been doing, i’m always on the look-out for easy sources of protein so i was intrigued by a power ball recipe from bryan cranston while flipping through a hemispheres in-flight magazine. i’ve never seen breaking bad so i don’t know if there are power balls on the show or what, but the recipe looked like it would have a lot more protein thanks to the addition of non-fat milk powder. sure enough when you run the numbers each ball has about 8 grams of protein which is almost the 10 grams you need to be able to claim to be an excellent source of protein. in the future i might look for ways to add 2 grams more of protein per ball, but this is a good start. sprinkle dry milk into peanut butter and mix thoroughly. add honey. shape into balls and put into freezer for 15 minutes. roll in mixture of coconut flakes and cocoa powder. makes about twelve, 1-inch balls. each has around 160 calories and 8 grams of protein. Previous Postwhiskey club: the irish whiskey edition.Next Postday 3127: first goalie practice!